There may be no other API more responsible for the growth in publicly-available APIs than Google Maps. While the search giant’s geographic service is the de facto standard for embedding locations visually, it’s not the only choice. However, what it’s made clear is that maps have become a necessary part of any developer’s toolbox. A basic use case is plotting places, such as local search results, as markers on a map. You might also add paths for multiple points, such as directions or a trail. More advanced usage creates interactions between front end code and the map–for example, click a search result and highlight the place on the map. Geographic search results: if you’re sharing search results for locations, you absolutely should be showing them visually. There’s no better way to display geographic data than a map. Confirm locations: display your user’s location visually, either immediately following address input or when retrieving the coordinates via mobile or other device. Whether for deliveries or simply a location-augmented application, you can stop errors and improve confidence. Store locators: plot your stores–or someone else’s–on a map. Search for the nearest and provide additional information in info boxes. While Google Maps may have played a major role in the growth of publicly-available APIs, it certainly didn’t invent map services geared toward the web. Of the providers, MapQuest is the only one that been in the map business since the 1990s. That enterprise-fueled income made it difficult for the company to shift gears to a self-serve model when Google Maps changed the game. Though Microsoft was in the mapping tool business since 2000 with MapPoint Windows software, it joined the web map craze in response to Google. Originally called Microsoft Virtual Earth, it re-branded as Bing Maps in 2009. MapBox is the newest entrant, built on top of Open Street Map, crowdsourced geographic data. Programmers are supposed to spend their working hours solving tough problems. Too often with APIs, the problems you solve are preventable with good documentation. This cost is all too often ignored by those making buying decisions. A poor developer experience is expensive during initial integration, then is paid with compounding interest every time you touch the code. This may be clearest with Map APIs, a rare category that is often part of both the front-end and the back-end. The 800 pound Gorilla of Google Maps does well on developer experience, but is slightly bested by relative newcomer MapBox for communicating status, encouraging support, and its proactive community outreach. Both provide excellent Getting Started resources and a free tier that can get most developers to production. MapQuest and Bing Maps also have plenty of resources, but are not as organized around quickly getting started, and appear to have more of an enterprise focus. Bing Maps, however, is the only provider that includes interactive examples, that allow you to change code and instantly see the result, a fantastic example of developer experience that seems like it should be part of any Map API documentation. 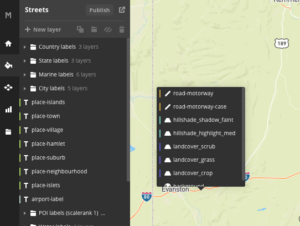 MapBox Studio lets you get very granular with styling. Every Map API provides ways to customize the look of markers on the map, including a custom graphic, and the ability to make each marker different. The big difference between these providers comes when looking at customization option for the underlying map itself. Bing and MapQuest provide no such functionality to the non-enterprise developer, which leaves the real comparison to Google and MapBox. Google Maps‘ styling uses a CSS-like syntax that is loaded along with the map, on the fly. You can control the visibility, color, and opacity of every visual element on the map. However, you cannot use custom textures, nor provide separate styles at each zoom level. By contrast, MapBox opens up its entire platform to be customized, though this must happen prior to map loads. The opportunities to customize your map are limited only by your ability to use the tools provided. Basic changes are easily accomplished, but geographic skills are handy for the most advanced options, including bringing your own data. For years Google Maps was 100% free, but that changed in 2011. Still, it provides the most generous free tier of any provider with pricing listed, only requiring developers to pay when usage reaches 25,000 map views per day for 90 consecutive days. 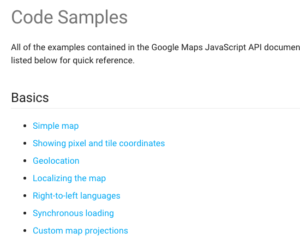 Now all Map API providers charge at some level of usage. The above table gives example pricing based on various usage levels, which assumes web views that are equally spread out throughout the month. This illustrates the level of usage required before Google begins to charge (at about 750,000 views per month).